I’ve seen lots of Melted Crayon art circulating around the internet for quite some time, but this is the first time We’ve given it a try. It was a really fun and rewarding project! Make this simple, vibrant and stunning Valentine’s day art for kids using this beautiful crayon melt technique! Melt the tip of the crayon [ be sure to remove the paper packaging before you attempt] and drip onto the sheet. Heat, Drip, Heat, Drip. Repeat till whole area is covered in dots. The crayon dots tends to chip off after a few days. A coat of Modpodge does the trick of keeping them in place. The last two are made by Lil P with intermediate hand holding. 🙂 The Blue is for hubby and red for me.. She pasted it on a card and wrote I Love Dad and I love Mom 🙂 I think I’m going to frame this one. This project is a perfect for making a card or even as wall art on canvas , and would make a beautiful piece to hang in a child’s room, class room, or any place that could use a beautiful pop of color! 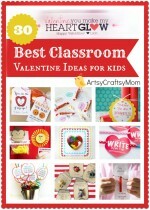 Follow Artsy Craftsy Mom’s board Valentine’s day Crafts on Pinterest. Show me some love.. leave a comment so I know you’ve seen it 😉 next, you’ll force me to start taking attendance :p .. all those present say aye! PS – this post was originally published in 2012. I have edited it with new pics & contents. « What makes a GREAT DAD? nice idea! 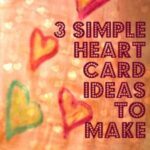 I remember playing with dried candle drops and making cards with them during my childhood days! As usual… a ‘sooper’ idea (as my daughter would say). sooooooooooo pretty!! I love love the second pic!! @OM: 🙂 Thank you. Its very very easy too. Just take care that it doesn’t get into a racing match between the twins. I’m so scared of fire around kids. i am sush..nice to meet you in this blog world..I like yout Template..and especially the way how it is snowing..
@priya. Working with broken bits might be tough for ammu.. attempt with care. Thanks Shama. Are you back from ur trip? Wow,,. :) thanks for the tutorial too,.. Very cute! 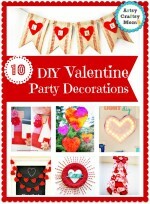 Loved this idea! Tried to do this with my son, 8 years – he loved the melting n dripping. But only one thing – the melted crayon was having some burned/charcoal in it – so it added a blackish tint to all colors.